Not long ago, the excitement in the Nigerian smartphone industry that died down late last year after the release of Tecno’s Phantom 6/6 Plus and Infinix’s Zero 4/4 Plus, has once again been stirred up by Tecno Mobile. It started with the announcement of the Tecno L9 and L9 Plus and continued with the rumours of a successor to the successful Camon C9 that was launched last year – the Tecno Camon CX (Camon C10). Now, the CX Air version has been launched and we have gathered all specs and features as it surfaced, the smartphone is called the Tecno Camon CX Air (Camon C10 Air). The major difference between the Camon CX and the Camon CX Air is in the camera department and the chip; the Air version has a less powerful chip and cameras with slightly lower specs than the Camon CX. Otherwise, the specs of both smartphones are similar. It is important to note that CX Air means the same as C10 Air, as the X there stands for a Roman letter that’s numerically equivalent to 10. The Tecno Camon CX Air comes with same a 5.5-inch display as its sister, the CX. The smartphone has a resolution of f 1080 x 1920 pixels (HD) with display density of 293PPI and bears the same metal unibody design found in the Camon CX. Also, to add to this, the new CX Air sports a 2.5D Glass Protector which brought about a slight curve at the 4 sides. The Camon CX Air is powered by a quad-core MediaTek MT6750T processor with a clock frequency of 1.25GHz, while its graphics processor is handled by a Mali T880. The phone has 2GB of RAM and 16GB of internal storage that can be expanded up to 128GB with a microSD card. In this aspect, the Camon C10 Air seems to stay on the same page with last year’s Camon C9 with its 13MP rear and front camera lenses, but there is a distinct difference; the rear of the C10 Air sports a dual camera flash light, something that was absent from last year’s series flagship. Both the rear and front cameras of the CX Air are accompanied by a LED flash. The Tecno Camon CX Air packs the same battery capacity, 3200mAh as the Camon CX. It is manufactured using the Lithium-Polymer battery technology, and the reason for the same battery capacity is probably to maintain its slimness. The phone comes with a dual micro-SIM slot and supports 4G LTE network connectivity. A Micro USB v2.0 port is present for charging with USB OTG (On-the-Go) functionality which allows you to connect to USB accessories on the fly. In terms of hardware, the CX Air, like its bigger counterpart, comes with a fingerprint sensor, unlike the Camon C9 that only possessed an ‘eyeball scanner’ for security verification. In the software aspect, Tecno steps things up a notch in the Camon C10 series by bundling them along with the latest version of the Android OS, Android 7.0 Nougat upon which the company’s custom User Interface, HiOS has been built. The Tecno Camon CX Air has been released with its bigger sibling in the series, the Camon CX on a 23, March by the company. When it’s fully available, you can buy the Android phone at leading online stores in the countries. 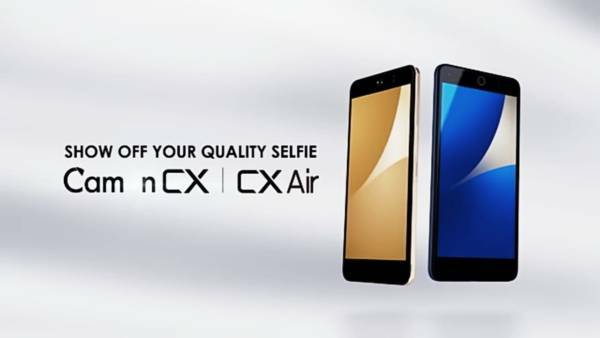 Tecno Camon CX Air price in Nigeria is expected to range from 50,000 Naira to 75,000 Naira. I saw it on Jumia for 64 thousand naira. Maybe i can get it for lease in physical shops. I have a 60k budget and i really need this phone.